1. Not shopping with a list. 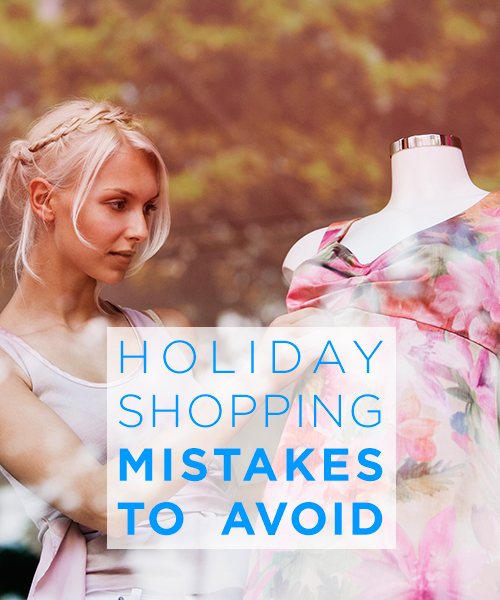 If you’re shopping without a list, you are at the mercy of impulse shopping—not a good place to be. Make a list and check it twice. 2. Not tracking holiday spending. The little things—table decorations, wrapping paper, gift cards—add up to a lot. 3. Not looking for a discount. Paying full price when you can find a better deal on just about anything doesn’t make much sense. Do a little research before you head out—and don’t wait until last minute panic sets in. 4. Not giving handmade gifts. When you buy prepackaged gift packages and baskets you pay top dollar. Make your own gifts—such as cookies and other homemade treats—and you’ll score extra points for thoughtfulness and save a bundle. 5. Not thinking outside the package. Want an easy (and low cost) way to check several folks off your list? Buy items in a multipack and break them up into individual gifts. Did you know? 57% of people reported the greatest happiness from spending money on experiences, compared to just 34% who found happiness from buying material things.1 Why? It turns out we create lasting memories with friends and family when we invest in activities, but our excitement over new things wears off quickly. This entry was posted on Friday, December 12th, 2014 at 2:46 pm	and is filed under Primerica. You can follow any responses to this entry through the RSS 2.0 feed. You can leave a response, or trackback from your own site. Good advise at this time of year.